What is NTBackup utility & Veritas backup? Why Windows 7, 8.1, 10 do not support BKF restoration? Backup of data files is generated by many sources; some of them are created using free in-built application i.e. NTBackup and others using Veritas utility. These backup files get corrupted due to various reasons and the restoration becomes painful. 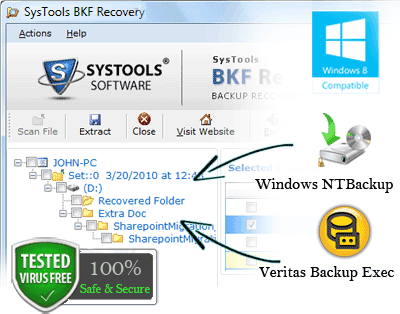 The BKF Repair tool provides a single platform to deal with recovery of both types of corrupted backup files created by Windows NTBackup utility and Veritas to serve both categories of users. This help the users to repair corrupt .bkf file and attain a perfect restoration without any complications and data loss. BKF stands for BacKup File and uses extension of .bkf. It is used to create a safe copy of all of the important data in a single file. It even serves as a substitute, when the original data on the system gets corrupted, erased or overwritten. In that situation one can repair & restore BKF and get the original data back to the system. This file format can be created using an inbuilt application of NTBackup utility present in Windows XP Operating System. It can be restored using same Backup and the Restore Wizard. Corruption can occur due to various reasons like; corruption due to virus attack, improper or interrupted backup creation, storage of backup on server or network, due to oversized backup, abrupt shutdown, CRC errors, etc. All these reasons lead to damage the internal structure of file and user demands BKF Recovery. As when user tries to restore it, errors are displayed conveying a message that backup file is unusable. This utility helps to remove such error messages. Windows 7, 8.1, 10 Do Not Support BKF Restoration? Backup and Restore facility present in Windows 7 is completely different from the previous versions. On the other hand, Windows 8 and 8.1 use File History to backup the data files. These tools are not compatible to restore BKF created by NTBackup Utility of Windows XP version. And hence, restoration of NTBackup's file is not possible in these versions of Windows. Although, Windows 7 provides some supplemental utilities to accommodate BKF restoration, but Windows 8 and 8.1 version lacks such supplementary programs. To make an error-free and smooth backup restoration process, BKF Repair Tool provides users a phenomenal experience through its perfect blend of engineering and features. It repair Windows backupwithin few clicks and saves the time and efforts of a user. Interface has been maintained to instruct novice users and to accomplish the task successfully. Once the corruption has been dealt user can restore the data files from corrupt BKF on Windows 10/ 8.1/ 7/ Vista/ XP etc. Three Modes of Scanning i.e. Quick, Deep and Range Based Scan. Choose the mode according to the density of corruption. Range based scan is provided when user wants to scan particular part (in percentage). Extraction at preferred location can be done, according to user's choice so that the extracted data files are saved at the location where users want to save. Save time and efforts by using the option of saving already scanned backup so that Windows backup recovery tool can directly fetch the already scanned file and save user's time. Recovery of Selective Files or Folders can be achieved by checking or un-checking the data when the user load BKF file in our software program. Search Option is available, if user is seeking for particular file in the backup loaded to repair corrupt BKF. The Free Trial Version of BKF Repair Tool is provided for users to survey its mechanism. An overview of the product is provided and it is avaiable completely free of cost. It lets the user to overview all the steps to repair & recover Windows BKF file. But, saving and extraction of the BKF files is restricted in this demo version. After the user get satisfied with this trial version and performance of tool, then, it can be updated to the purchase licensed version which also allows to save and extract the repaired BKF file without any restrictions and data loss. Copyright © 2013-2018 www.excelrecoverytool.com | All Rights are Reserved.